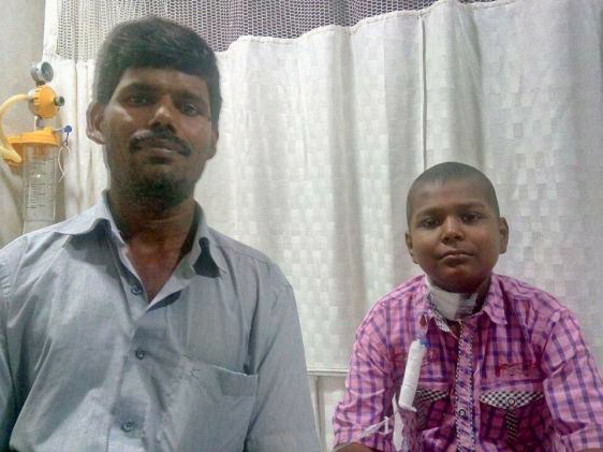 Vignesh, a 12-year-old child, hailing from a poor family from Puthoor, Andhra Pradesh, was diagnosed to have T-Acute Lymphoblastic Leukemia, a very severe type of blood cancer in 2012. The family brought the child to Kanchi Kamakoti Childs Trust Hospital in Chennai for treatment. Chemotherapy was initiated and despite many hurdles, Vignesh completed his total treatment of 3 years in 2015. Vignesh went home happily after successfully defeating his dreaded disease. Things were going smoothly when he suddenly developed fever and red spots in his body 1 year after completing treatment. Investigations were done and the family and doctors were shocked to know that the disease (T-ALL) has come back. Parents were motivated to start further treatment despite the very aggressive nature of the disease. The only curative treatment available at this stage is Bone Marrow Transplantation. Vignesh’s only sister was, unfortunately, not matched to donate the stem cells. The next best donor is Vignesh’s father who is 70% matched, and a plan is to go ahead with haploidentical transplantation. The parents were farmers from a poor family in Andhra Pradesh, are unable to meet the financial cost towards further treatment. 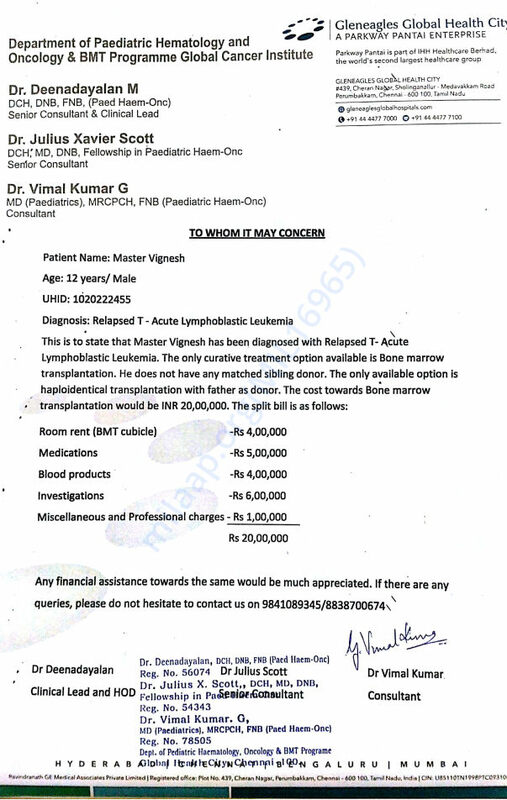 Since this disease is life threatening and bone marrow transplantation needs to be done as soon as possible, any financial aid towards Vignesh’s treatment would be much appreciated. Here is a quick update on Vignesh's health. He is presently at home and has been going to the hospital for regular check-ups. His health has been improving and hopefully he will have a complete recovery quite soon. Thank you all for showering your blessings and support on him. Vignesh is currently coming regularly for his follow-ups. His recovery post the bone marrow transplant is going well. Sometimes, he undergoes blood transfusions as and when required. He is doing well and will be on medication until the doctor advises otherwise. We are all relieved and thankful to all of you for being so supportive. Here is a quick update on Vignesh. Vignesh is currently 3 months post-BMT and is doing well. He is undergoing regular follow-ups with the doctor. He needs further ongoing follow up and medications for next 3 months. Thank you for the support and love for Vignesh.